If you’re like most success-oriented people, you dream of gaining control over yourself and your life. That would be the ultimate accomplishment for many. Are you looking for strategies on how to create successful habits? Are you looking to overcome procrastination for your upcoming projects? Are you looking for real success keys that will help you activate success in your own life? Well look no further, this book is for you! You will learn success principles that will guide you to a life of the success you truly desire. 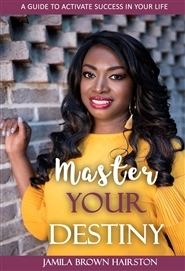 Learn from Author Jamila Hairston on strategies that she has used for over 15 years with the success of her companies so you can serve your purpose and Master Your Destiny!